Cake Sense | Hello Saigon! 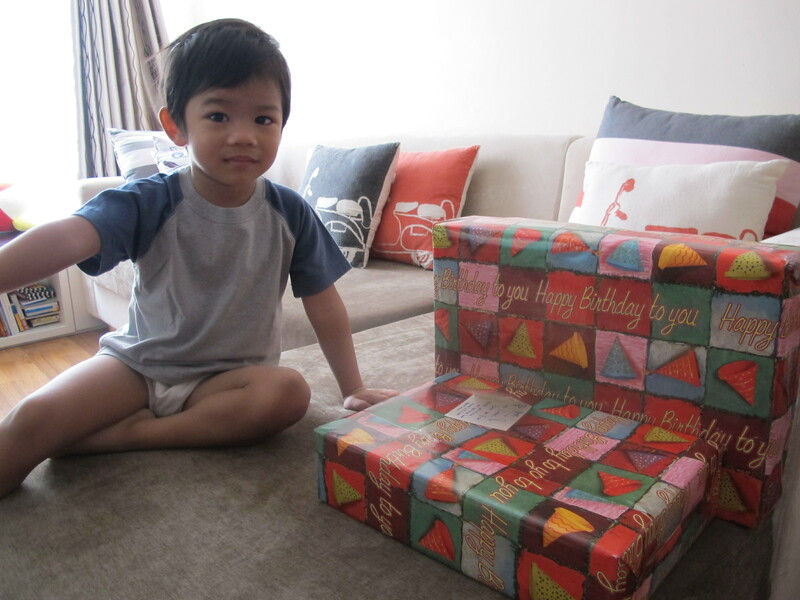 It was my son’s 3rd birthday last August 23. Throwing a party wasn’t what I really had in mind since his birthday falls right after our trip to Danang and I felt it would be tiring to prepare for a big bash. So we didn’t. Prepare for a big bash I mean. We just had the party at home and just ordered food and had our closest neighbors as our guests. Mom and I just bought balloons to spruce up our apartment and that was it. It was a rainy Tuesday evening when we had the dinner party and we weren’t hopeful if a lot will come but surprisingly we had a good turnout and the Sam was one happy 3 year old! We had two terrific suppliers for the party that delivered really well and in this blog post I would like to commend Cake Sense. I first heard about Cake Sense through the An Phu Neighbours Email Group. Hearing a terrific review from a fellow neighbour, I decided to get in touch with them. I sent them an email the evening of the 21st. Short notice, I know! Ms. Tam called me in the morning of the 22nd and emailed me too. 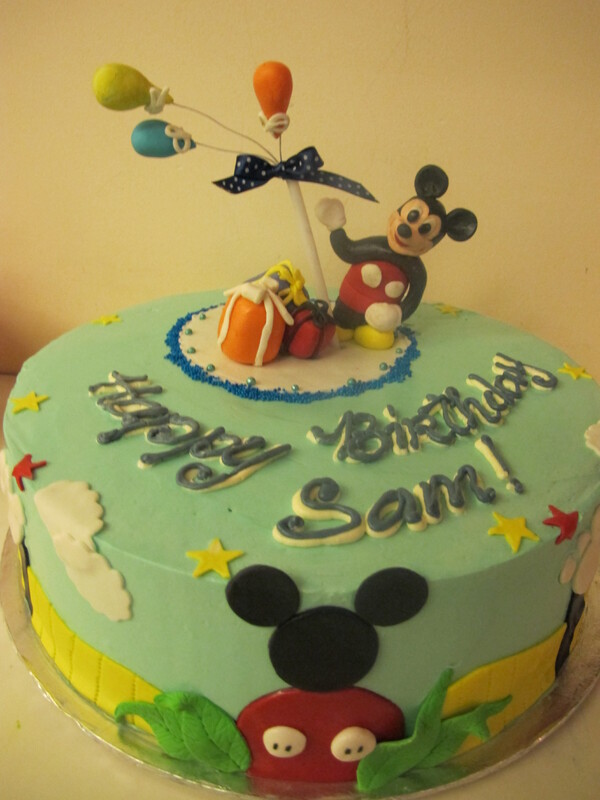 I wanted a Mickey-shaped cake but of course I knew with just a day before the party, they’ll be pressed for time. 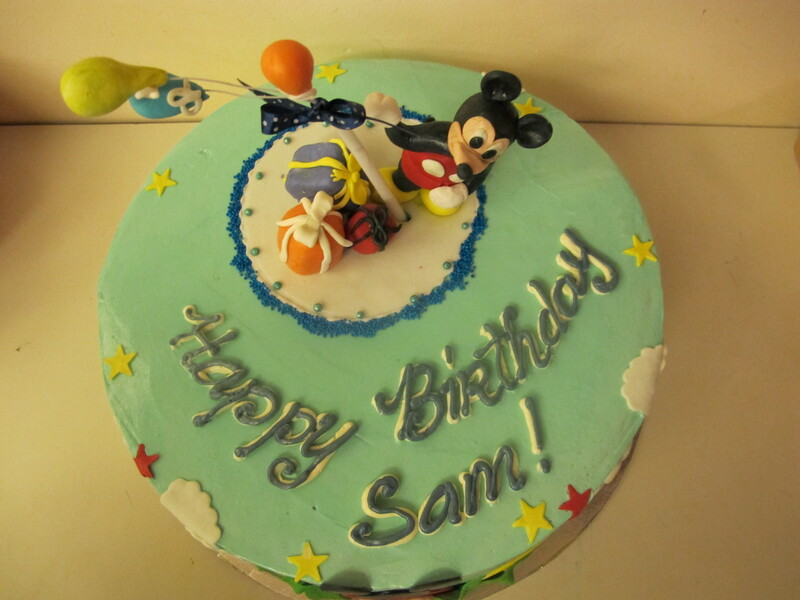 So I settled for a circular cake with Mickey Mouse designs. For a cake that was made in a rush, it came out just fine! We asked for the butter cream and the kids loved it! Ms. Tam and her assistant arrived on time even through the rough weather. The cake got swiped by another bike during the transport but Ms. Tam’s assistant fixed the cake just right. Sam fell in love with his cake instantly that he wanted to eat this as soon as he saw it saying, “Mommy, I’m hungry!” But of course we had to wait for the guests — and so we had to distract him a whole lot till he forgot about his birthday cake. So there, do try Cake Sense. Call them up at 090.281.3711. This entry was posted in Spills and tagged cake, Cake Sense. Bookmark the permalink. Pingback: Mang Jun | Hello Saigon! Pingback: Happy Halloween! | Hello Saigon! hi, thinking of trying them out for my kid’s bday cake but wonder about how the cake would taste. i just don’t want the cake to look nice, dapat masarap din. were you able to sample it beforehand? if not, how did it taste? my butter cake standard taste is the goldilock’s butter slice. how did the cake compare to that? Hi Jen! Been here in Saigon too long to remember how Goldilock’s butter slice tasted. 😦 I think Cake Sense’s cakes are good enough. Our family and friends enjoyed the cake. Maybe you can just let them know your taste preference — if you prefer a not too sweet taste or not. They’re pretty flexible.